Do you feel like ditching the blade and switching to an electric shaver? You’re not alone, as many men appreciate the convenience of electric shaving and the ability to get a close shave with the switch of a power button. We’ll also discuss rotary shaving buying tips, the basics of using a rotary shaver, and make a comparison between rotary and foil shavers. Before you grab the first brand name rotary shaver off the shelf – and there’s nothing wrong with brand names, mind you – here are some tips to keep in mind. 1. What type of skin type do you have? Skin type is important when choosing any razor, traditional or electric, including when choosing a rotary razor. The reason is this: most rotary shavers don’t work as well on sensitive skin as foil razors. Is it a reason to eschew buying a rotary shaver altogether? Well, no, but it’s certainly something to consider carefully. 2. Can you use it for wet and dry shaving? An electric razor that’s good for “wet” shaving means that you can use it under the shower and/or with your favorite shave cream or gel. It also means that you can clean it with tap water. A dry shaver, meanwhile, means exactly what it implies, i.e., that you can only use for dry shaving (no gel, not water). 3. What comes with it? Accessories are important to the overall value of a rotary shaver. 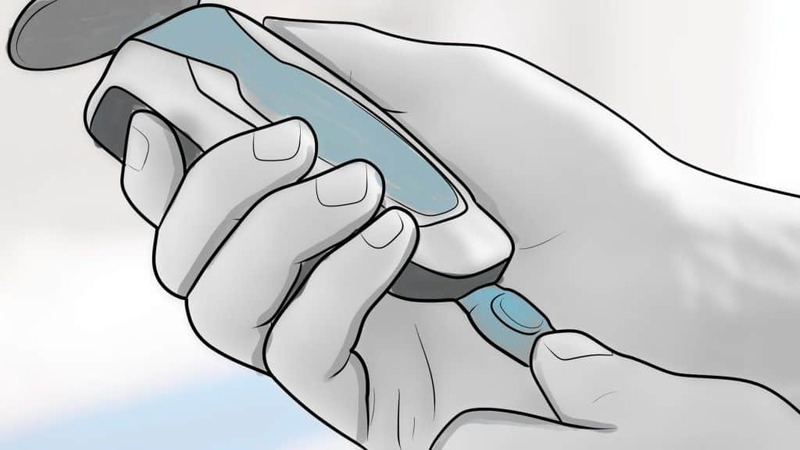 Most come with a trimmer that handles the “detail” work of your sideburns and mustache, while other accessories might include an LCD that lets you know how much battery life is left before a charge is needed. Some electric shavers run solely on battery power and you must charge the battery every so often if you want to continue to use your shaver. Some come with power cords which plug into a wall outlet; you won’t have to worry about your battery running it out but you’re restricted by the length of the cord if you want to move around. Finally, some shavers offer both corded and cordless use. 5. What’s the battery’s runtime? If you prefer a cordless shaver, make sure you know how the run time of your battery. Most quality rotary shavers have between 45 minutes to an hour of runtime until the battery needs a charge. Lithium-Ion batteries are a smart choice because they generally hold a charge better than other batteries. Another important feature is the shaver’s charging process. In some cases, a charging feature is part of a cleaning deck or station. 6. Can it cut thick hair? Not every electric shaver, rotary or foil, can handle the tough work of cutting longer facial hair. Thick whiskers often grow in different directions, making the job even tougher, but most rotary shavers are up to the task because of their circular pivoting techniques. Make sure the one you choose does the job when you haven’t shaved in several days. 7. What kind of warranty does it have? Most of the top brands offer two-years warranties on their shavers, which is a good warranty to have. But check the warranty to see what it covers; it’s always a bonus if it includes parts such as the shaving head. A good pivoting system is essential for maneuvering the shaver around your face’s different contours. 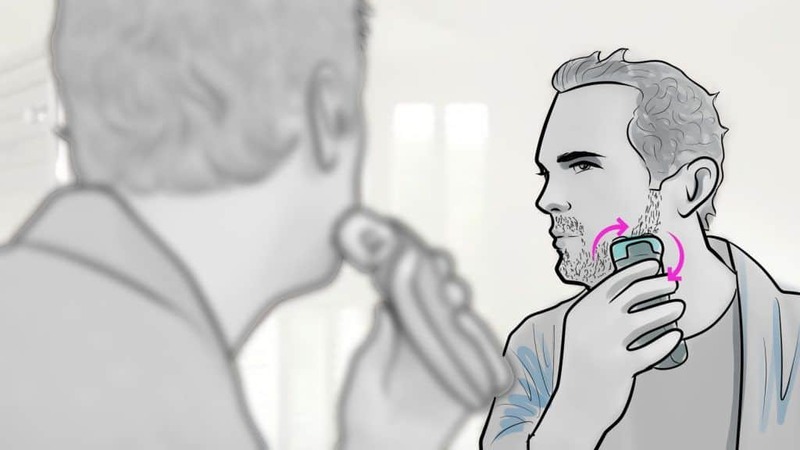 The more your shaver can rotate and maintain a circling direction, the more it will adapt to your face’s natural curves. 9. How easy is it to clean? The bottom line is that rotary shavers aren’t as easy to clean as their foil counterparts. 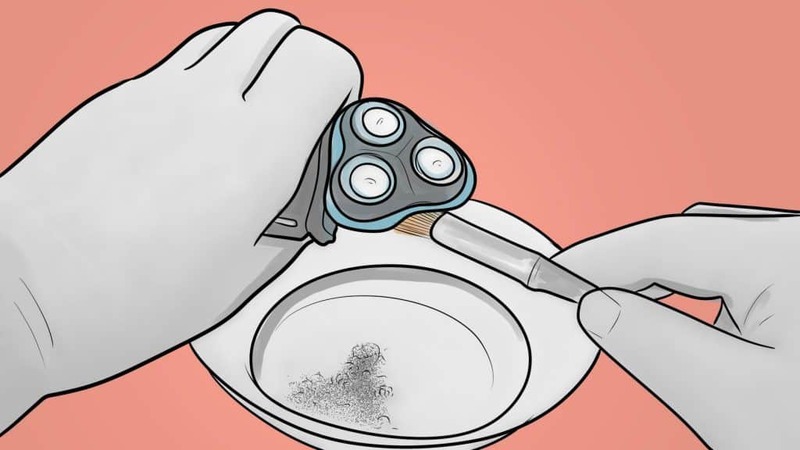 You should clean the individual parts of your rotary shaver every few days. If your rotary shaver comes with a cleaning dock – and many do – it saves you the time and energy spent on manual cleaning. We said that there’s nothing wrong with choosing a brand name shaver, especially when you consider that a few well-known companies dominate the electric shaver market. 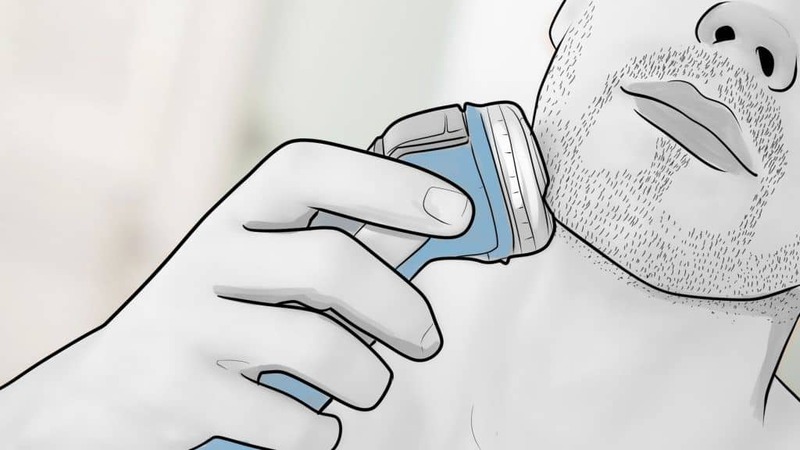 Feel free to choose a shaver from a lesser-known company, but you may get what you pay for. Next, let’s take a look at our picks for the best rotary shavers of 2019. 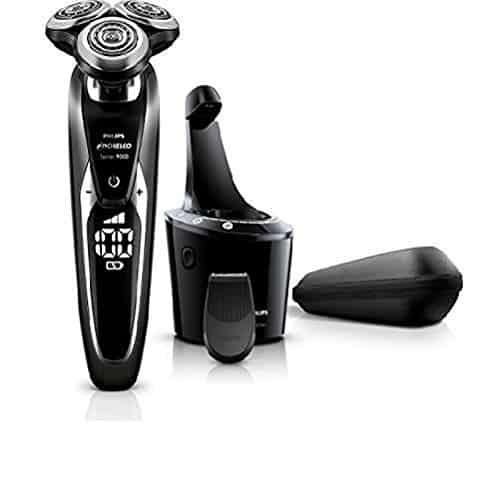 It’s not easy choosing between Philips Norelco’s many fine products, but the 8900 is the best of the lot in their rotary shaver lineup. The 8900 has too many quality features and works too well not to include it on a list of top shavers. Indeed, it has many attributes that make it worthy to be on our list and the best rotary shaver available. We can start with its innovative technology, including PN’s Contour Detect Technology in which each shaving head moves in eight directions and, according to the company, cuts up to 20 percent more hair than other rotary shavers. Another reason you’ll get a close shave with the 8900 is its V-Track Precision blades that collect whiskers in the optimal cutting position. You’ll get a closer-to-the-skin shave without skin irritation or discomfort. The blades self-sharpen, so you can count on a close shave every time you put the razor to your skin. The 8900 features five built-in length settings that allow you to trim everything from stubble to a short beard. Meanwhile, rounded tips and combs also help to prevent skin irritation. Many users also appreciate that the Philips Norelco 8900 is waterproof and suitable for wet and dry shaving. If you feel like using the 8900 in the shower or with your favorite shave cream, no worries. We also like the 8900’s SmartClean System that provides easy maintenance because it cleans, lubricates, dries, and charges your razor. You’ll appreciate that you don’t have to clean your shaver by hand, which can be a bigger task with rotary shavers. The 8900 comes with a Lithium-Ion battery that provides 60 minutes of use before you need to re-charge it. An hour of charging returns it to full power. All in all, the 8900 is extremely user-friendly thanks to its Contour Detect System and V-track precision blades. You’ll find it easy to use even if you’re new to electric shaving. 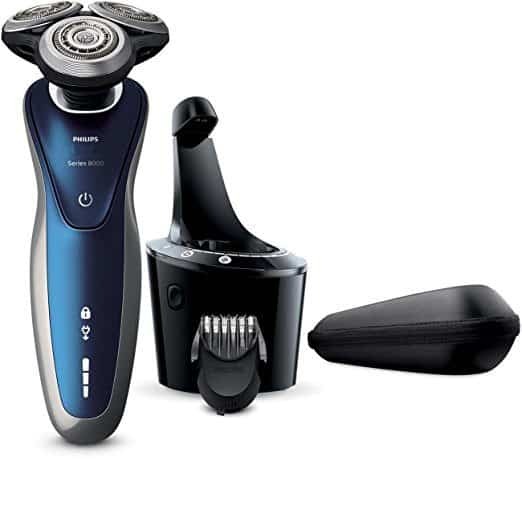 It’s saying something that the 8900 is the best Philips Norelco rotary shaver because the company routinely makes quality products. The 8900 features technology that makes for a close shave, ease of use, and easy maintenance. It’s the best men’s rotary shaver, regardless of brand. “Verso,” at least in this case, means versatility and that’s an apt description of the Remington XR1400 Wet & Dry Men’s Shaver. Whether it’s your daily shave, a touch-up, or even changing your beard or mustache style, the XR1400 is equipped to handle the job. 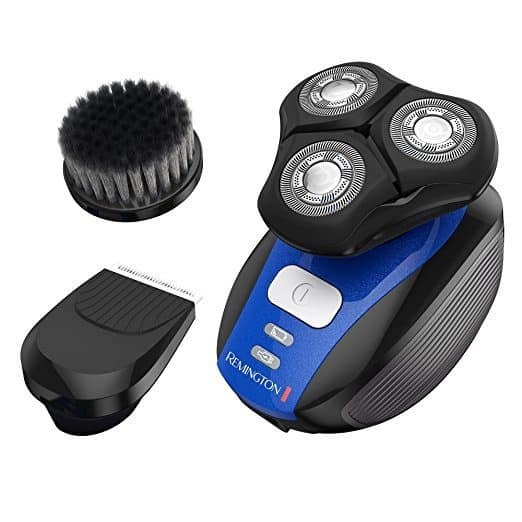 It’s definitely the best Remington rotary shaver, not only for all that it does, but for an innovative, unique design that includes a body which fits easily and comfortably into your hand. There’s a lot more to like about it, as well. The XR1400 features HyperFlex technology that enables it to adjust to any angle. This feature makes for a smoother, comfortable shave without the irritation you experience with lesser-quality shavers. The shave heads trim long and short hairs (such as stubble) efficiently. A rubberized grip on the ergonomic body design helps give you better control over your shave. The shaving heads feature Remington’s PrecisionPlus technology that adapts to every contour and angle of your face. You’ll have 10 adjustable comb lengths at your fingertips that allow you to trim everything from short stubble to several days worth of growth. The Verso is 100% waterproof and therefore suitable for wet and dry shaving. It also comes with a charcoal-infused bristle brush that attaches to the shaver and scrubs away sweat, dirt, oil, and other grime while giving your skin a deep clean. Using the brush before you shave helps to reduce skin irritation. The XR1400 comes with a lithium battery that provides 45 minutes of cordless runtime. The durable travel pouch is a bonus and allows you to transport the XR1400 Verso easily. It’s ideal if you’re someone who travels a lot or is always is on the go. The Remington Verso XR1400 stands out for a lot of reasons, including a unique design that makes it easy to handle and maneuver around your face. It’s a quality product from a company that knows a thing or two about electric razors. OK, back to Philips Norelco, a company that sits above all the rest when it comes to making rotary shavers. Products such as the 1250X/40 live up PN’s lofty reputation while providing men with a superior shave. Yes, you’ll pay top dollar for the Senso Touch 3D shaver (also known as the Shaver 8100), but there are reasons why it comes with a heftier price tag – a lot of reasons. Such as, for instance, its unique Gyroflex 3D technology that enables its shaving heads to contour in three ways: flexing outward, flexing inward, and pivoting around. The three shaving tracks enable you to catch every hair and get a closer shave. The three dynamic parts move independently of each other and allow you to follow the contours of your face without using extra pressure which may irritate your facial skin. The shaving heads utilize Philips Norelco’s UltraTrack technology and cover much more skin surface than the majority of rotary shavers. Their lift and cut action, meanwhile, lift hairs and cut below them below the skin surface for the ultimate in closeness. The Senso Touch 3D is good for wet or dry shaving and comes with a pop-up trimmer that handles the detailed work of shaping sideburns, mustaches, goatees, and more. 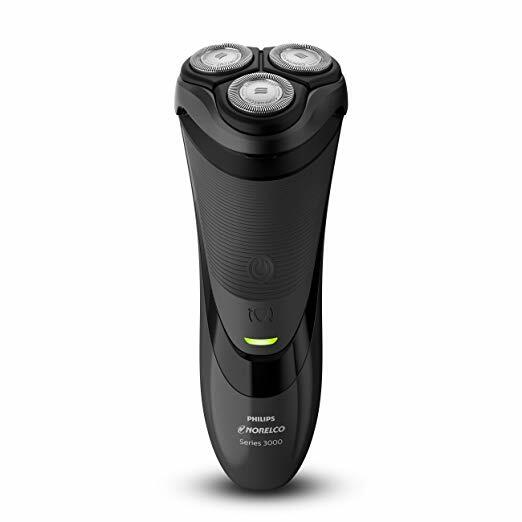 It also comes with a Lithium-Ion battery that provides up to 50 minutes of shaving power. The shaver fully charges in one hour but also has a 3-minute quick charge option to give you enough power for a full shave. A touch control LED indicates how much power remains. The SensoTouch 3D is an advanced rotary shaver that has all of the features necessary for achieving a close shave. It’s fast, powerful and comes from a company known for creating the highest-quality rotary shavers. The PN 3100 is an update in its Series 3000 line and offers some new features, not the least of which is redesigned shaving heads. It also has a new color scheme – black – but, new features or not, it still delivers the kind of performance that loyal Philips Norelco customers expect. The 4-direction flex shaving heads not only represent an upgrade but help make it easier to shave the various contours of your face and neck. The heads move independently from each other as they adjust to the face’s unique curves and maintain contact with the skin no matter what prominent facial features you may have. The heads also help provide a comfortable shave that’s non-irritating and good for all skin types. The 3100 features a Comfort Cut Blade System in which the blades have rounded edges that move smoothly over the skin. Like the shaving heads, they help produce a protective shave that doesn’t irritate the skin. A lithium-ion battery provides plenty of power and will give you up to 45 minutes of (cordless) shaving time. 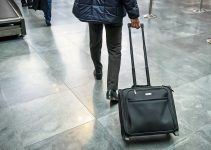 While Norelco says it takes up to eight hours to bring it back to full charge, some reviewers say it takes less time than that. Besides, the 3100 comes with a power cord, so you don’t have to experience any interruption in your shaving routine. The back of the 3100 shaver features a pop-up trimmer that’s excellent for detail work, such as shaping your goatee and sideburns. While the 3100 has a slightly larger body than many other razors, it’s surprisingly lightweight for its size. It also has a well-balanced, ergonomic design that makes it easy to grip and maneuver as you navigate your face’s nooks and crannies. The front of the shaver features a rubber-like material with horizontal striations that help enhance the grip. The 3100 is easy to clean, because you can rinse it with tap water to clear away those clipped whiskers. The 3100 comes with a power cord and a protective cap and also features an LED display. The Norelco 3100 provides a comfortable shave that enables you to navigate all of your face’s contours without a hitch. It’s another quality product in Norelco’s long line of excellent shavers. Good luck trying to beat the Norelco 9700 regarding state-of-the-technology; then again, any rotary shaver with a digital user interface that provides all the information you need instantly qualifies as high-tech. There are plenty of other cool features – as one would expect from Norelco – including AquaTec technology that makes it suitable for wet and dry shaving. Whether you want to use it in the shower, with shave gel or foam, or simply dry, it’s your choice. It’s hard to surpass the 9700 regarding performance, as well. Its V-Track precision blades gently capture hair before clipping it close to the skin and, says Norelco, provides a 30% closer shave than most other razors. The blades are self-sharpening, so you’re assured of a close shave every day. Another thing that’s cool about the 9700 is that it comes with personal comfort settings that make it easy for you to adjust the shave to suit your needs. That includes a “fast” setting that helps you get a quick shave when you don’t have much time to spare. The sensitive setting, meanwhile, offers a gentler – yet still smooth – shave that’s great for men whose skin becomes irritated easily. But there’s so much more, including shaving heads with Contour Detect Technology that move in eight directions to cut more hair in a single pass than many other shavers. There’s also a precision trimmer that handles all the detail work (sideburns, goatee, mustache, etc.) and is easy to control. We think you’ll also like the 9700’s ergonomic design that makes it easy to grip and maneuver as you shave. It also comes with a powerful Lithium-ion battery that delivers 60 minutes of shaving after a 1-hour charge. There’s even a 5-minute quick-charge feature that gives you enough time for one shave before you place it back in the charger. Oh, it also features a SmartClean PLUS system that cleans, lubricates, dries, and charges the 9700 all in one shot. The cleaning system has a skin-friendly, alcohol-free formula, and cleans hair, gel, and other gunk, thanks to a unique dual-filtration system. It even lubricates the blades to reduce friction. The 9700 gives you everything you need, and then some, to get a comfortable, close shave. Its various features are second-to-none and represent the top of Norelco’s multi-faceted line of shavers. Practice, patience, persistence – they’re the three P’s that help you get better at most tasks, including using an electric shaver. 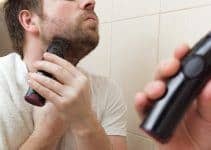 That’s especially true if you’re a newcomer to electric shaving, but the following tips can help you get a better shave whether you’re a newbie or a veteran. 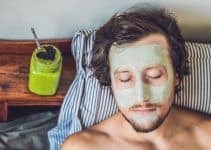 Most men have areas on their face that are more sensitive and prone to irritation than others. Identify those areas before you fire up your rotary shaver and start the shaving process. It’s wise to shave the sensitive areas of your face first before your electric shaver heats up. Doing so helps to reduce skin irritation. There’s no need to apply extra pressure with your razor as if you were manually sanding wood. Use gentle strokes instead and let your rotary shaver handle the bulk of the work. Let it glide in a circular motion without irritating the skin and use only enough pressure that’s needed to get a close shave. Should I shave with or against the grave? There’s seems to be something of a debate about this question, but the consensus seems to lean toward shaving against the grain when using an electric razor. Another effective way to avoid skin irritation is to use a shave cream or gel. The lather will add another layer of protection from the moving parts of your rotary shaver, as well as condition your skin. Dry shaving is always an option, especially when you’re running late and don’t have as much time for your grooming routine, but you’ll increase the risk of irritation your skin. It’s nothing but an aggravation when your shaver’s battery runs out in the middle of a shave. Letting it charge when not in use is an easy way to avoid this problem and, besides, you always want your shaver to be ready when you are. Your post-shave isn’t a shave at all but it is about pampering your face after you’ve put your shaver away until next time. First, wash your face with cold water (use warm water when you’re shaving, however) to remove any leftover shaving product and to close your skin’s pores. Next, pat your face dry – don’t rub it – with a soft, clean towel. It’s important to use a clean towel because you don’t want to transfer oils, bacteria, or soap to your face. Last, but not least, apply a soothing, moisturizing aftershave cream or lotion. Be wary of scented aftershaves if you have sensitive skin. Check out our review of the top aftershaves. An electric razor that’s clogged with whiskers and the gunk left behind by your shave cream won’t, A) last as long, and B) protect you as well from skin irritation. Cleaning your shaver after every use is always a good idea and, in the case of some, may only require a rinse under tap water. Carefully follow the cleaning instructions that come with your shaver. Your choices of electric shavers come down to two types – foil and rotary. We’ve already talked at length about rotary shavers, the best models available today, and how to use them, but it’s important to know the differences between the types as well as the advantages and disadvantages of each. The biggest difference between rotary and foil shavers is the type of metal grating, i.e., the shaving head, that grabs your whiskers so the blades underneath can cut them. 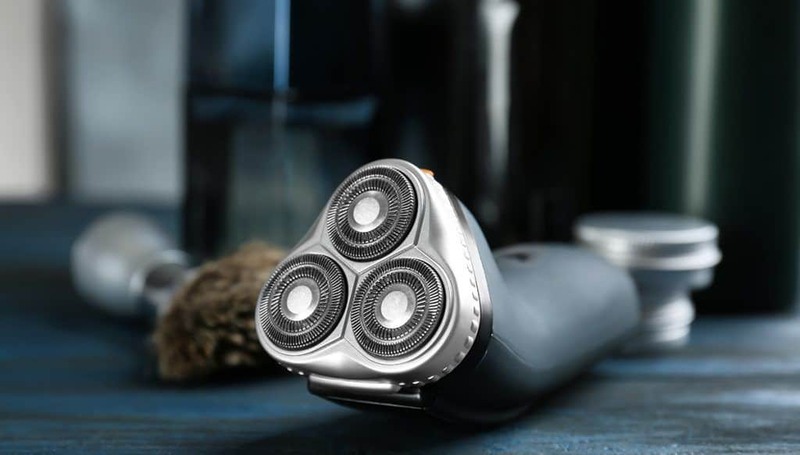 A rotary shaver has three flexible shaving heads that capture facial hair to allow the blades to do their work. A foil shaver has a thin, foil comb as its shaving head, and several rounded blades beneath it that cut your whiskers. The foil covers the oscillating blades and lifts the hair away from the skin so the blades can do their work, while it also limits the contact between blade and skin. Again, the most noticeable difference between rotary and foil shaves is their type of shaving head; a rotary shaver has three to four oval shaving heads placed in a staggered pattern. A foil shaver utilizes a thin metal strip of foil as its shaving head. Another difference between the two types of electric shavers is the type of shaving motion you use for each one. You’ll get the best results from using circular motions with your rotary shaver, while foil shavers do their work in the straight lines, either vertical or horizontal. So, when or why would you choose a rotary shaver over a foil shaver? Here are some guidelines and suggestions. Rotary shavers do a better job than foil shavers on thick, fast-growing facial hair that grows in different directions. If you’re one of those guys who has a 5 o’clock shadow at 10 a.m., or who lets a few days pass by without shaving, then a rotary shaver could be your best bet. If you have tough skin, perhaps when you’re older and have been shaving for many, many, years, then it’s worth checking out the best rotary shavers on the market. A rotary shaver does a nice job of shaving the many contours of your face. Rotary shavers are quieter than foil shavers. They’re not as good on sensitive skin as foil shavers. If you’re prone to skin irritation but still prefer a rotary shaver, remember to shave in gentle, circular motions without pressing down on the skin excessively. Foil shavers tend to have faster motors than rotary shavers. While a speedy motor doesn’t necessarily mean you’ll shave in less time, it does play a part in how efficiently it shaves your whiskers. Look for rotary shavers with faster motors. Rotary shavers are generally harder to clean than foil shavers. In many cases, cleaning a rotary shaver means removing a bunch of parts and then re-assembling it again once you’ve cleaned out the excess whiskers and leftover shave gel. In turn, that creates the temptation to put off cleaning your shaver, which will shorten its lifespan. Foil shavers are faster than rotary razors in most cases. The speed of the motor is important for providing a more efficient shave. If you choose a foil shaver, not only should you check its cycles per minute (CPM) but also whether its speed diminishes – along with its cutting efficiency – when its battery power wanes. Almost every shaving expert agrees that foil shavers are better for men who have sensitive skin. 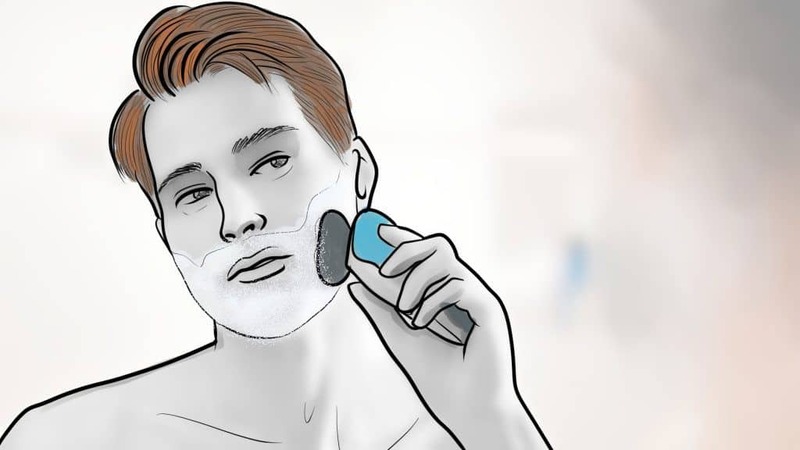 While a rotary shaver does a superior job of bending to the contours of your skin and work well on longer, fast-growing facial hair, they’re not quite as kind on the skin as rotary shavers. If you prefer to shave in straight lines, as you would with a traditional manual razor, then you won’t have much trouble adapting to the foil shaver. Many men think foil shavers provide a closer shave, although that’s not always the case – especially if you use a quality rotary shaver like those we list above. One of the reasons why a foil shaver may give you a closer shave is its micro foil shaving head, which is thinner than the foil on a rotary shaver. Foil shavers often work better for detail work such as tidying up your sideburns or mustache. Or, for trimming around your awesome goatee or soul patch. It’s usually easier to maintain a foil shaver than it is a rotary shaver. If it’s waterproof, cleaning it simply involves rinsing it under tap water to remove the leftover bits of hair and shaving cream gel. Cheaper models may require you to remove the foil before rinsing out the shaver. Foil shavers are noisier than rotary shavers. While we’re not talking rock concert loud, your foil shaver may be noisy enough to disturb those you live with, especially if they’re sleeping. Some men don’t like that foil shavers require one-position shaving because they only work if moved in a straight line. You move your rotary shaver in a circular motion, which may be better for shaving around your face’s trick contours. Foil shavers don’t work as well – in most cases – as rotary shavers on longer hair. If you don’t shave every day while letting your whiskers grow longer and thicker, then a rotary shaver is a good option. If you shave daily, however, then a foil shaver will do just fine. A select few companies dominate the electric shaver market and they didn’t become dominant by manufacturing inferior products. That’s not to say other brands don’t have good shavers, but it’s hard to choose a best-of rotary shaver list that doesn’t include the heavy-hitting brand names. Nonetheless, we used the same criteria for every shaver, brand name or not, and it came down to the closeness of shave, ease of use, versatility, the ease of maintenance, and whether you can use it for wet or dry shaving, or both. We hope it’s a list you find useful. As always, we love to hear your feedback and suggestions? Do you use any of the rotary shavers on this list? What’s your favorite shaver and why? We’d love to hear from you. I searched for so long to get an article which describes how to use a rotary shaver and about some best rotary shavers available in the market. Now think I found that article. This article is full of knowledge about rotary shaver. Thanks for such a helpful and informative article.